Barbara Brackman's "Stars in Her Crown"
Thread: Barbara Brackman's "Stars in Her Crown"
Welcome Chevyfreese!! So glad to have you join us!! 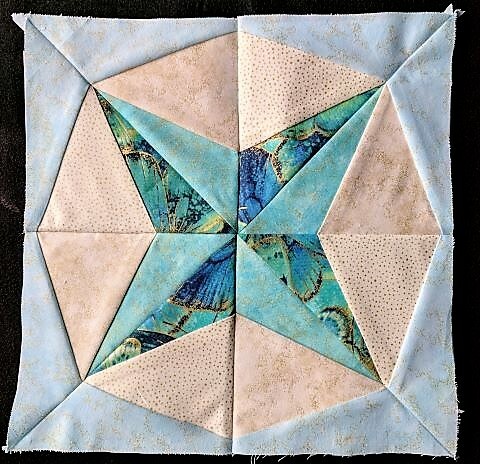 This is a pretty design by Barbara Brackman and can be done in two sizes of block 8" and 12". She presents a new block each Saturday on her blog Material Culture. Be careful when printing each block out - you have to make sure that the size prints out correctly and it may need tweaking to get it correct. She gives info on her blog in the right hand margin on how to do that. I think that the pattern will only be available for the time that it is being presented on BBs blog so I suggest that you print out each week's block. She also has links on her blog where the designs for all 9 blocks can be purchased from her directly. This past week has been a little chaotic here with the terribly cold temps during this polar vortex. We have had to go out and check on our four senior relatives who range in age from 88 - 98 everyday and deal with their issues that have come up. They all had issues that really needed our attention so that they would not go into panic mode...sometimes it was twice a day ... Ok DH and I dealt with it and they are slowly getting back to normal today. I was planning on doing double the number of blocks so that the result would be a larger top. In between these senior visits I would quickly cut and sew together some of the sections of the first few blocks so that I could catchup for tomorrow's Block #5. I'm using paper piecing to make the blocks. Last edited by costumegirl; 02-01-2019 at 08:54 AM. I know I have promised pics of my blocks and they are coming soon. Thanks for being patient with me - life is giving us a few bumps in the road right now. Finally getting to post my blocks - anyone else have any to show? Last edited by costumegirl; 02-06-2019 at 04:05 PM. FYI - I noticed that that there will be a documentary series called "Queen Victoria and her Nine Children" on TV next week. It will be broadcast here on public television on Monday Feb 11 but I did find it online - here's the link (hope it's ok to give it but if the link gets deleted just look online if interested. 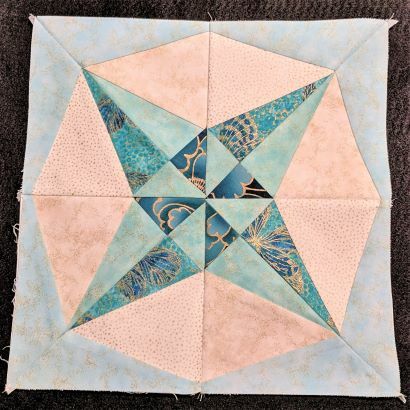 Block #6 - Louise is on BB's Blog! This has been a fun project and depending on color values each block can give a different effect even though the design is based on similar triangles. I'm trying hard to play with the color values for my blocks. LOL not sure if it is working but they are coming together. Will try to post more pics tomorrow. **Anyone else have blocks to share? Would love to see them or the fabrics that you are using or thinking of using!! As you can see I'm not using the traditional Victorian floral fabrics though I think many are very pretty. I'm using quite a few of the Northcott Artisan Spirit Shimmers and some of the Artisan Spirit "Flights of Fancy". Many in this line has gold highlighting. I thought the gold highlights would add some sparkle to the blocks and help to make it appropriate for celebrating Queen Victoria's 200th anniversary of her birth. Gee I was wondering if I had a wool pressing mat if it would to help flatten/ dry press the bulky seams when paper piecing? Anyone use it for this purpose and have good results? Great pictures, costumegirl! It looks like you will have a soft, feminine colored quilt. Pretty! Can you explain the steps you are taking to create the file that you use for printing your pattern to use for paper piecing? I've read BB's instructions, and gone to the other page she suggested, but it's not working for me. Last edited by givio; 02-10-2019 at 06:59 PM. Givio - I totally relate! I had a very difficultt time following the instructions given on the blog and was stressing out over it - LOL I am not as mathamatically oriented as I used to be and though I dabble I'm not computer savvy. It takes me a long time to redraft any changes that I want or envision. I had spent many hours trying to change the size to the 8" and 12" block - that was my first dilema! Second dilema was because I wasn't too fond of my fabric that made up the secondary block star so I wanted to slightly change the pattern by adding a diamond shape in the centre of this star that would form when all the blocks are put together - that will be done just before I join the blocks. The pattern was resized in Microsoft Word - LOL I struggled!! then I broke down and asked my computer savvy friend (known her for a very long time and consider her my "bonus daughter"). She did it in Microsoft W in less than 5 minutes!! What an angel!! If you can wait till tomorrow I will ask her to give me the step by steps & post instructions for getting the block the right size - she showed me how but I know she will make the explanation easier than I. If you don't have MW she might also have other options that can be used. Last edited by costumegirl; 02-10-2019 at 07:49 PM. Are you getting the ice storm? We live across the river from Detroit MI close to Lake St Clair and got whacked this morning hard! All of our windows facing east are covered in a layer of ice. If you got this nasty stuff do stay safe! Last edited by costumegirl; 02-12-2019 at 05:48 AM. Thanks for the help. I'll probably try again on the weekend, when I have more time to fiddle around with it. I have a limited version of MW that came free on my lap top that I might be able to use as you suggest. Yes, for sure! Plenty of snow and ice here on the other side of the river. My employer tends to give us a free lunch as a reward for braving cold and bad driving weather. We've had free pizza or tacos a few times lately! The eastern coast seems to be getting hit hard as well these last days. Last edited by costumegirl; 02-16-2019 at 06:53 AM. Block 7 is on BB's Blog this morning!! Reminds me of Block 5 except the center is on point. If you have lots of projects on the go and are planning to possibly do them later be sure to save the patterns for yourself. I think they will be taken off the blog once the sew along is finished in 3 weeks. You can also purchase BB's pattern from her Etsy shop. There are links in the right hand margin of her blog. Do check out the many pics of blocks done by others on Facebook and Instagram - so many lovely fabric combinations!! I’ve saved a few of the blocks but lost track of where I am in that process. I haven’t made any because I have some other projects in the works & haven’t gotten to these yet. So far the colors used in her blog don’t inspire me. I like bright colors & hers seem dull to me. Maybe I’ll try one with my own color combo once I’m through with current projects. I like the shapes she uses just fine so I will probably experiment with some test blocks. Conchalea - I hope you get a chance to try the design with your own colors. I have seen a few examples where modern colors and fabrics have been used and the design really pops giving a crisper look. When I saw the design I liked the concept using the different triangles and rearranging them into different blocks. I am going to skip Block #6 right now and move on to #7. I ordered some fabric for #6 so that I would have a bit more variance for my "light" and "medium" values. Should arrive next week - hope they work out ok - if not I will have to rethink my fabric placement. I like these blocks but where do you sign up to get the patterns for each block? Homecaregiver - Patsy - There really isn't a sign up. I hope you join us and try the blocks!! It is an interesting design and can be done in reproduction fabrics to very modern. 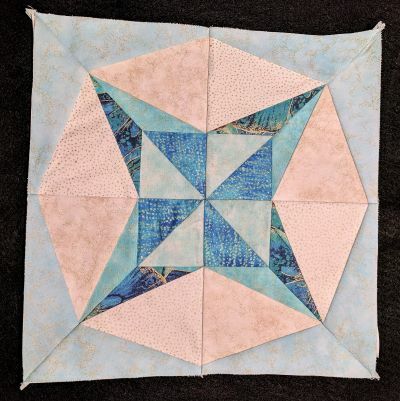 The blocks are part of a "sew along" on one of Barbara Brackman's blogs called "Material Culture". She gives a block each Saturday along with historical background on each of Queen Victoria's children. This week it was Block 7 - There are links in the right margin for each of the blocks. There are 9 blocks plus a border. A summary of the info for the first 4 blocks is given here in this discussion in Post 26. Last edited by costumegirl; 02-17-2019 at 10:11 AM. 1) On the block patterns sometimes the end of a sewing line for a point doesn't go exactly to a corner or to a meeting end point line - some are ok but some are not and are slightly off. It may be a printer or photocopying problem - not sure but there are lines that are sometimes off and not lining up. Try to look at the sewing lines ahead before you sew and determine where you think it should go and line it up and possibly draw in a line to follow so that if you want a sharp final end point you can make the adjustment. I played "rip it" a few times because I took for granted that things lined up and didn't like the result of the lines not going into a corner or losing the point under another piece. 2) I may be wrong in changing the sewing order for the following Blocks but it has worked out ok for me and I found it easier to piece. I'm sure you will find what works best for you. In Block #4 it is easier to join B, C, & D together first. After cutting the quarter section on the diagonal, what I did next was cut off part A from the halved diagonal section first and then joined pieces B, C, D and E. After that I taped piece A back on, snuggling it up to the line with B, C, and D and joined it on meeting the end of E. There may be another way to do it but it worked out ok for me. Looking at Block 6 it may require joining B and C first and then adding A and D.
With Block 7 although the order given could be followed, I am joining B, C and D first and then adding A. Hope this info makes it easier for you sewing the blocks together. Last edited by costumegirl; 02-17-2019 at 03:24 PM. Wow was it ever a nice day here today!! Lots of sunshine instead of those cloudy grey skies and not too cold! It was a good day to run errands and get groceries. Tomorrow we won't be so lucky - forecast is cold, freezing rain and then snow! But hey!! Spring is just around the corner and hopefully it will get here soon!! My tulips are just waiting to poke their heads out! The fabric I ordered for my Block 6 hasn't arrived yet so I moved on to try the next one. 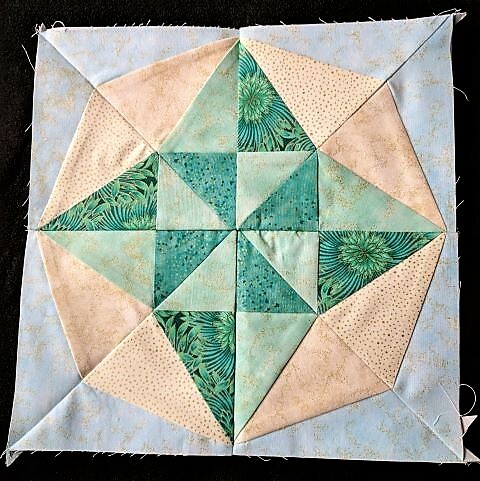 The hardest part with this block was deciding which fabric to use for the different pieces and how to arrange it. Yeah!! The Northcott fabric I ordered arrived and is going to work out fine for Block #6 Louise. Will post results when it's finished! I did some reading about Princess Louise and found her a very interesting and talented person. Not only are her paintings, sculpting and designs amazing but she did a lot to foster education and independence for girls and women along with many other humanitarian endeavours. She was quite a survivor as she battled against the "norms" of the times for Victorian women and the expectations of Queen Victoria. Last edited by costumegirl; 02-20-2019 at 03:59 PM. For this block when working with the half diagonal of the quarter sections, I did join pieces B and C first, then D and then did A. It went together fairly smoothly. In retrospect, I could have done the same for the half diagonal of the quarter sections for Block 4 - sew together first pieces B, C D, and E and then do A.
I had posted that I had cut A off and then re-taped it on but cutting it off was not necessary - just extra work. I could have done the same as for #6 and it would have worked out the same and been easier. LOL I blame not doing paper piecing very often and my inexperience. Now I will know better when I do a second set of these blocks to make this a larger quilt. 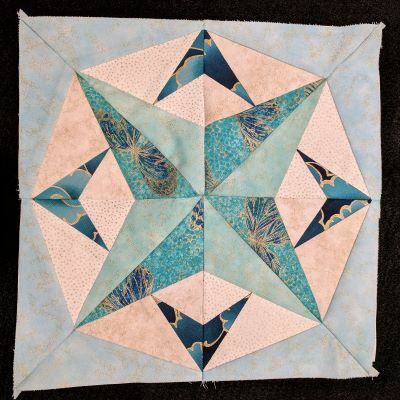 Does anyone else have any blocks to share or any comments on doing Paper Piecing? I must admit some blocks were a little finicky but overall fun to do. Block #8 Leopold is on BB's blog this morning!! The sew-along is almost over and there is only 1 block left after this and then the border!! February has seemed to have flown by - only a few days left!! As I look out my window I can see frost on the roofs of the houses in my neighbourhood - Winter is trying to make a last appearance with a dull cloudy morning and rain coming tonight. It will be a good day to get errands done and a start on Block #8!! 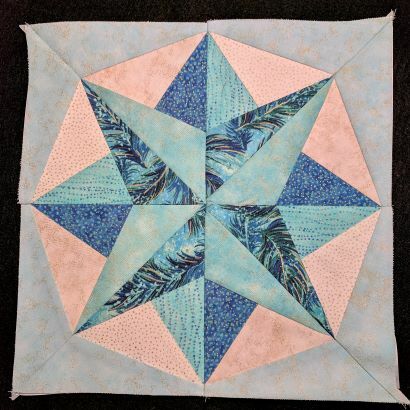 I am having difficulty managing those center seams when putting the blocks together - they are so bulky - perhaps it will be better when the paper is removed but I don't want to do that until I join the blocks together. I am debating whether I should press them open to help flatten them out a bit. Again I'm wondering if I should purchase a wool pressing mat to make it easier. I do have a Clapper somewhere from my garment making days but haven't pulled it out in a long time. 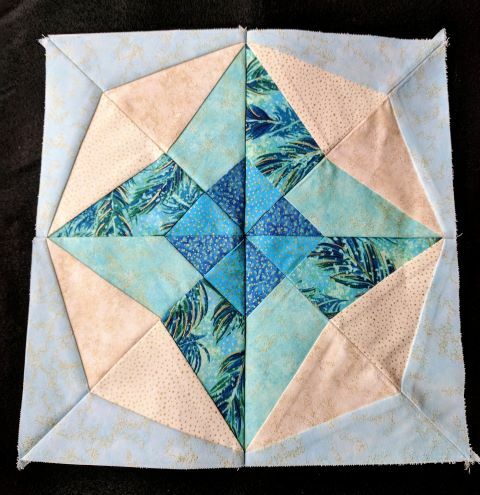 If you have any Paper Piecing tips or Pressing tips that will help others out in navigating through a project please share!